Joey sadly died September 17th 2012. 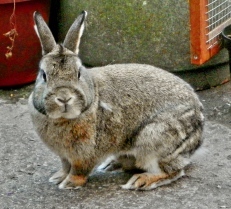 He was four years old.Joey came to us from the RSPCA rabbit rehoming scheme. 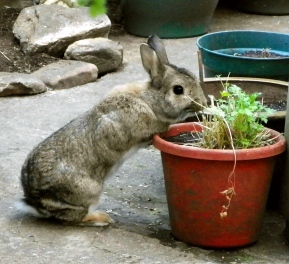 We already had given a home to a Netherlands Dwarf Rabbit called Sooty whom we had rescued from a neighbour who was not able to look after her. Joey was to be a companion for Sooty and Sooty of course a companion for Joey. They bonded almost straight the way and the following day after introduction they were sitting side by side grooming one another. 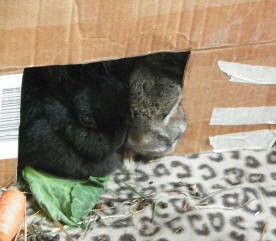 It was wonderful to see poor little Sooty who had lived almost all her live alone in a tiny cramped hutch now enjoying the pleasure of companionship with another rabbit. Joey was such a timid creature and we were never able to make him feel less nervous. He resisted being picked up but when of necessity there was no choice he would settle down and cuddle into my husband's neck. He was a real sweetie, the gentlest of animals, he never attempted to bite anyone or scratch even during difficult times when he was having his claws cut or when he was at the vets or having to have medication. He was always so patient with Sooty. He had come to us via the RSPCA from a situation of neglect, his companion had had to be put to sleep because of an abscess. We think he spent most of his life in a hutch and may have been dropped at one time because his teeth were out of alignment and the vet had said this may have been the reason, however he could simply have jumped from too great a height quite by accident as nearly happened while he was in our care. Other than speculation we know very little about his circumstances before he came to live with us. Joey was four years old and looked like a wild rabbit. A lump was found on Joey's lip during a routine examination at the vets only about a month after my husband and I adopted him. The lump was removed for examination and was found to be a very malignant aggressive form of skin cancer, very rare particularly in rabbits. A second surgery was performed to hopefully remove the tumour which the biopsy had showed remained. We waited in hope that the vet had got it all and it had not spread and that it would not return which we were told was possible. With fingers crossed and considerable hope and yes maybe a good dollop of denial we did our best to make little Joey's life a life worth living. You can never give any domesticated animal a truly good life free as nature intended but Joey and Sooty were given as much freedom as possible, right from daylight until evening they had the run of the garden. And in the final week or so both Joey and Sooty were taken to our allotment, a large enclosed space with trees, bushes and overgrown grass for a few hours where they were able to run as rabbits should. The Saturday before Joey died we believe he had thoroughly enjoyed exploring and running round in the allotment more than he had done for a long time. Joey will be sadly missed by my husband, son and I and by his sweet loving companion who groomed him and sat by him more closely in the last three weeks before he died as though she knew he was sick and needed extra attention.